Scientists from the German Cancer Research Center (Deutsches Krebsforschungszentrum, DKFZ) and Heidelberg Institute for Stem Cell Technology and Experimental Medicine (HI-STEM) have now shown that this process is regulated by the MYC oncogene. If MYC is turned off in mice, embryonic stem cells and early embryos enter a reversible biochemical state of dormancy. However, this does not affect their ability to differentiate into any cell type of the body. When MYC is reactivated, the dormant embryos are able to develop into healthy animals. After a gestation period of around ten months, fawns are born in early summer – when the weather is warm and food is plentiful for the mother. Six months would actually be enough for the embryo’s development, but then offspring from mating in the later portion of summer would be born in winter. Therefore, nature prolongs the gestation period by a hormone-regulated pause in the development of the early embryos. Many animal species use this process, called diapause, to adjust their reproduction to environmental conditions. “The biochemical dormancy of MYC-depleted stem cells reminded us strongly of the process of diapause, which has remained completely elusive so far,” says Roberta Scognamiglio, who is the first author of the study. 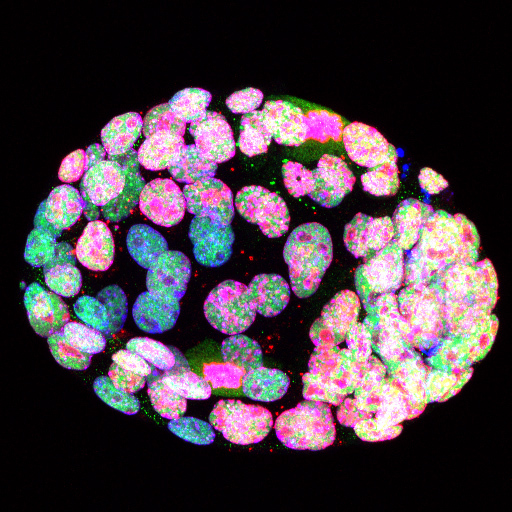 “In this process, too, embryos in the early development state, called blastocysts, enter a dormant state without growth and almost without metabolism prior to nidation in the uterus.” In order to find out whether these two phenomena have the same cause, the researchers compared the activity of all genes in MYC-depleted embryonic stem cells with those in diapaused mouse blastocysts. In both cases, the groups of genes that were inactive besides MYC primarily controlled protein synthesis and cell growth. The stem cell factors, however, continued to be produced unchanged. Trumpp thinks that MYC can also have a disastrous effect on cancer stem cells, particularly on dormant metastasis stem cells. When they migrate through the bloodstream to distant organs, they may come under the influence of signaling molecules that form, for example, in inflammatory processes. These might stimulate their MYC production and thus cause them to grow into metastases. “We now try blocking MYC as a strategy to control these dangerous sleepers,” the stem cell researcher says.